Though not here yet, summer is on its way. And while signs of winter can still be seen, as daylight saving time began in NSW last weekend, our barbeque has been beckoning us. Today we had good reason to give in and so enjoyed our first of the season. And what’s a barbie without some yummy fresh salads? Originally from my friend Amy, the following Asian Noodle Salad is my all time favourite salad. It’s so tasty and filling it could easily be eaten on its own as summer style main course. For these reasons, it’s a terrific option when needing to cater for vegetarian friends and can you believe, this scrummy salad is also egg, dairy and gluten free. As if it couldn’t get any better, this very large salad is so affordable, costing around $8 to make and serves 15+ people as an accompaniment or 8 served as a main. Cook noodles for a couple of minutes only, until soft, in a large pot of rapidly boiling water. Drain using a sieve or colander and run lots of cold water through the noodles to stop the cooking process. Rinse out pot with cold water to cool it down, ready to use again for combining the salad ingredients. 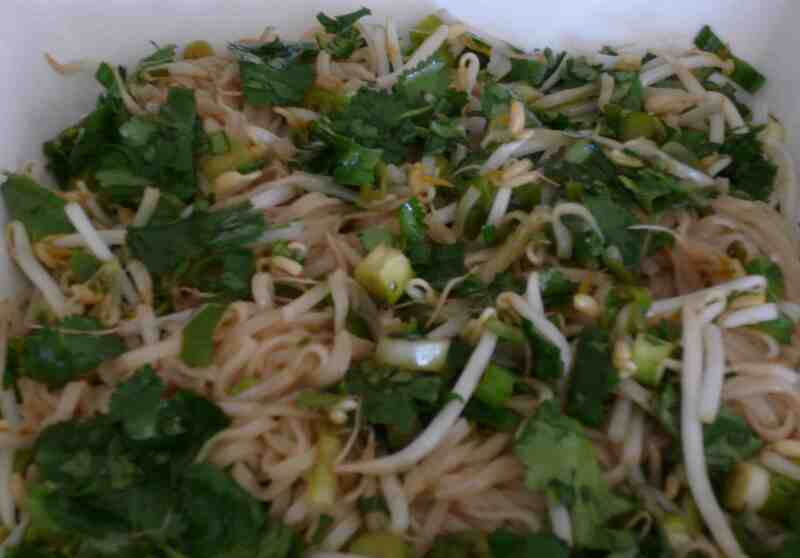 Place cooked noodles, coriander leaves, bean shoots and chopped shallots in the cooled down pot. Set aside. In a jar with a tight lid, shake together soy sauce, peanut oil, sesame oil and lime/lemon juice. Pour dressing over all the ingredients in the pot and toss well using tongs. Transfer to a large salad bowl and serve at table. Enjoy! Good pick up, thanks Elizabeth. I made a note next to the soy sauce.